Protection for steam cleaning equipment. Left untreated water used in commercial steam cleaning equipment will become clogged with scale and other contaminants which will result in reduced efficiency and eventual break down. Scale will begin to build up on heating elements, meaning it uses more energy to heat up resulting in higher energy bills. Small bore pipes will also silt up resulting in restricted water and steam flow. Scale build-up can be a hidden enemy. It will coat heating elements, reduce the bore size of pipes and openings and generally restrict steam and water flow. Improve the efficiency of your steam cleaning apparatus with suitable protection from WaterCare. Avoid expensive repair bills and equipment down time. Softened water needs far less detergent to clean thoroughly than hard water does. This can means considerable savings can be made on detergents and other cleaning materials as well as being far better for the environment too. 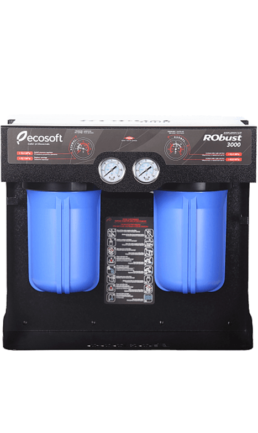 A compact high-capacity reverse osmosis unit for professional use. It produces soft, clean and safe water for steam cleaning and other uses. Output 145-150 litres per hour. 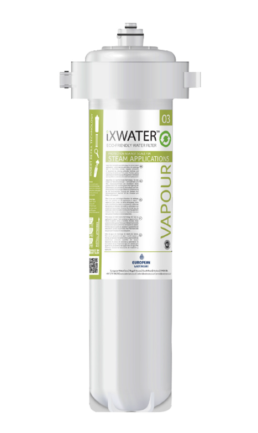 The iX Vapour 03 has been specially designed for use with steam equipment. Its Insert Refill Technology provides a sustainable and cost effective alternative to mainstream cartridge filters already in the marketplace.